Prime Minister David Cameron will raise human rights concerns with the Mexican president Enrique Pena Nieto during his three-day state visit to the UK, Downing Street said. There has been growing pressure on the president over the abduction and alleged murder of 43 students. The Mexican president has already met Deputy Prime Minister Nick Clegg, Home Secretary Theresa May and several dignitaries, including the Queen and the Duke of Edinburgh during his visit. Human rights campaigners are using the visit of Pena Nieto to highlight what Amnesty International UK has described as “out-of-control” torture in Mexico. Amnesty has urged the British prime minister to discuss human rights issues in Mexico with Pena Nieto. The students' disappearance and alleged slaughter in Ayotzinapa in September last year sparked weeks of protests across Mexico against corruption and violence. Cameron's official spokesman said: “You can expect the prime minister to raise concerns that have arisen with regard to human rights and the judicial system in Mexico. Pena Nieto has vowed to strengthen the rule of law in his country. Amnesty International criticized the government of former president Felipe Calderon, which declared a “war” against drug traffickers in 2006. Amnesty International UK’s Stop Torture campaign manager Tom Davies said: “While President Peña Nieto is getting the red-carpet treatment, his police and security services have serious blood on their hands. 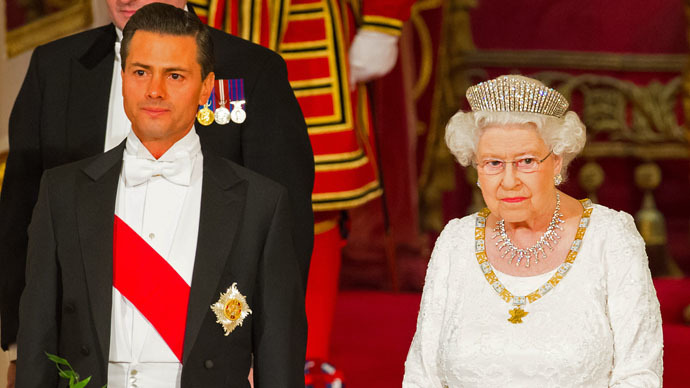 Pena Nieto was welcomed with a banquet hosted by Queen Elizabeth II at Buckingham Palace, where he and his wife Angelica Rivera are staying until Thursday. Ahead of the president’s visit, around 150 Mexicans protested outside Downing Street, calling on Cameron not to turn a blind eye to Mexico's “human rights crisis.” Some had their faces painted as skulls, traditionally worn during the Mexican Day of the Dead festival. The chanting crowd counted to 43 in memory of the missing students.